The colourful daisy-like flowers of osteospermum brighten up the border or patio with their cheerful blooms that open with the sun and close as evening comes. They come in a range of colours, often with contrasting centres, and produce blooms from late spring right through to the first frosts. They are easy to grow and propagate and provide good value colour and interest to the summer garden. This is a smaller plant and so good for the front to middle of the border. Many will also spread and create good ground cover. Choose your variety carefully as not all are hardy enough to make it through winter in the colder parts of the country. This guide will help you choose the right variety for your garden and cover the care required to plant, care for and propagate this cheerful little plant. Osteospermum is a half-hardy perennial. This means that it will not always survive a British winter. For this reason, many people treat these plants like annuals, planting new ones at the beginning of each season. However, the hardier varieties will often make it through even quite cold winters. O. ecklonis and O. jucundum are two of the hardier varieties that have been known to survive temperatures as low as -10. As the plants are easy to propagate from cuttings, many people take some as a precaution against winter losses. Alternatively, the plants can be overwintered indoors. The plants look wonderful in containers or in beds and borders. O. Jucundum and O. ‘Stardust’ will spread and can make good ground cover. There are some lovely varieties with ‘spoon’ shaped petals. These are generally more tender though and should be planted in pots, so they can be moved indoors in winter. O. ‘Buttermilk’ has creamy yellow petals and a dark red centre. It will reach 60 cm (23 inches) in height. O. ‘Cannington Roy’ is on the hardier end of the scale and its foliage is evergreen. It has white flowers with a purple tinge. It will reach a height of 30 cm (12 inches) and will spread to provide good ground cover. O. jucundum is a frost hardy variety and spreads in clumps when planted in beds and borders. It has pinky-white to soft-red flowers from June to September. It reaches a height of 45 cm (18 inches). O. ‘Lady Leitrim’ is another frost hardy type. It has white flowers that are tipped with pink and the centres are yellow and blue. It flowers from May to September and reaches a height of 50 cm (20 inches). O. ‘Silver Sparkler’ is usually grown as an annual as it is quite tender. The large white flowers have a silver sheen and the centres are deep indigo. It flowers from May to November and reaches a height of 35 cm (14 inches). O. ‘Snow Pixie’ is a lovely variety with masses of pure white flowers against a backdrop of dark green foliage. It is a low growing variety reaching only 15 cm (6 inches), however, it will spread. It will also tolerate hot and dry conditions well. O. ‘Soprano white’ is another lovely white variety with sapphire blue centres. It will reach 30-35 cm (12-14) inches in height. It is relatively frost and heat resistant. This is a more tender variety with stunning shape and colour. It has distinctive spoon-shaped petals. The petals are white on the top and blue-grey underneath and the centre of the flower is blue. It will reach a height of 60 cm (23 inches). Osteospermum are easy to look after. Once established they require little care and are generally a cheerful and self-sufficient addition to the garden. Many will spread and provide good ground cover, too. Osteospermum likes to be in a sunny position either in the border or in a pot on a nice sunny patio. They will flower best in full sun; however, they will tolerate partial shade. These plants tolerate dry conditions well. However, they should be watered well in the first two weeks after planting. Once established, they may need watering once a week if the weather is dry. Container grown plants should not be allowed to completely dry out as this can cause them to drop buds. These plants prefer free draining soil, so, if yours is on the heavy side, add plenty of grit prior to planting. They like a reasonably fertile soil so add some soil improver or organic compost if yours is less than ideal. Ensure that any pots used for these plants have plenty of drainage holes so that the roots do not get soggy. 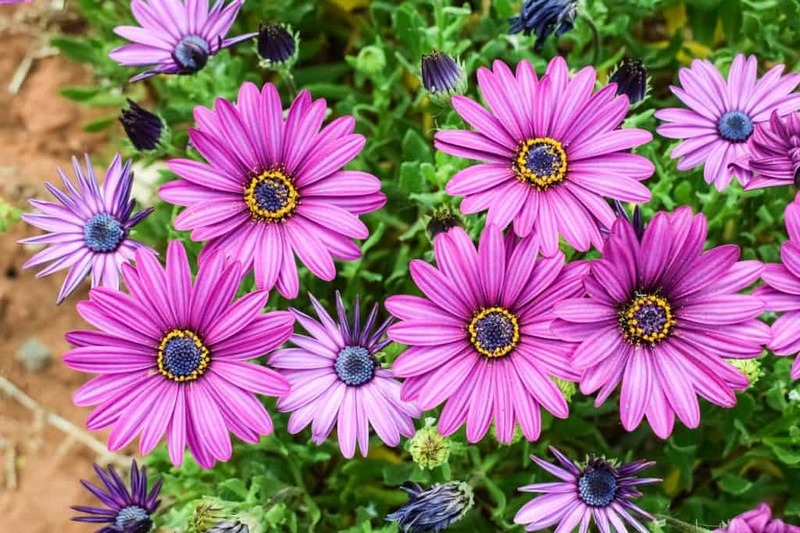 Feeding your osteospermum fortnightly in the growing season will promote flowering. This is especially important if they are grown in containers. Osteospermum can be planted out in May once any chance of frost has passed. Choose a sunny location in free draining soil. Bought plants should be planted as soon as possible after purchase. Mix a light application of organic fertiliser or soil improver before planting. Dig a hole twice the width of the rootball. Position so the plant is level to the soil in the same relation it was in the pot. Backfill, firm in and water. If you are planting out plants you have grown from cuttings, prepare the soil by digging in some organic fertilizer or soil improver. Using a trowel dig holes 10-15 cm (4-6 inches) apart depending on the mature size of the variety you have chosen. Remove your plants from the pot, tease out any tangled roots and put them in the prepared holes. Backfill the holes and then firm the plants in gently to remove any air pockets around the roots. Water well. Your osteospermum requires little in the way of maintenance. You can deadhead your plant and cut back any straggly or wilting stems to keep the plant tidy. In addition, feed fortnightly during the growing season. Pot grown plants should be repotted once the rootball becomes congested. Choose a new container a few inches larger than the plant’s rootball. Ensure the pots has adequate drainage holes and cover these with some broken crocks to prevent them from becoming blocked. Osteospermum are bright and cheerful plants that add an element of gaiety to any garden. If you love the jazzy look, then just plant lots of varieties together and enjoy the bold, clashing colours. It’s probably wise to include a few other plants with them however as they sometimes stop flowering in very hot weather. This could leave your border looking a little bare in midsummer without anything flowering. Something like petunias, coreopsis or ageratum would work well. If you are looking for a subtler addition to the garden some varieties are a little more muted. ‘Snow Pixie’ is a lovely little variety that would suit a white garden, prairie garden or a cottage garden. Another striking but sophisticated planting scheme is to combine ‘Soprano White’, which has a blue centre, with other blue flowers such as salvia or veronica. The bright colours of osteospermum also look good against simpler, plainer colours. Planting with white flowering or green flowering plants or against a backdrop of foliage allows the Cape daisy to show off without becoming too garish. Try a white agapanthus such as ‘Albiflora’, a white allium such as ‘White Giant’ or a yellow-green heuchera such as ‘Citronelle’ or ‘Lime Marmalade’. The hardier types of osteospermum benefit from cutting back to around 3 inches in height in early spring before new growth starts. By removing most of the old foliage, you will encourage the plant to put its energies into producing new growth. 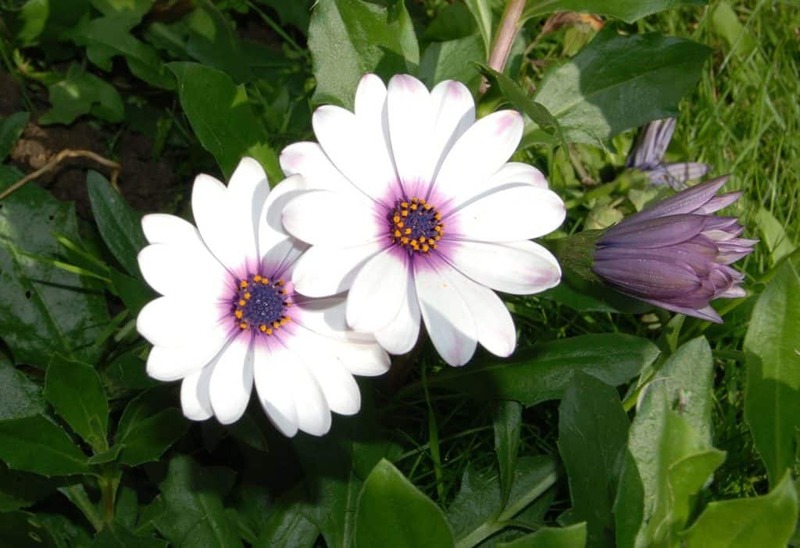 Most osteospermum are hybrids and will not grow true from saved seed. If you don’t mind what colours your plants turn out to be you can try propagating from seed by just scattering the seeds on top of the soil in a seed tray and pressing them lightly to make sure they are in full contact with the soil. Do not cover them as they need light to germinate. Many varieties are not reliably hardy, so it is advisable to take cuttings in case your plants don’t make it through the winter. The best time to do this is late summer or early autumn. You can grow your cuttings in 7 cm square pots or in module trays. Use a mixture of moist peat-free compost and almost as much perlite. This will improve drainage and make sure the mixture is not too nutrient rich, therefore helping the development of roots. Alternatively, you can use a specialist cutting mix. Make several holes in the pots, or one per module with a pencil. Cut a 5 cm non-flowering shoot just below a leaf node and remove the leaves from the lower third of the stem. Dip the base of the stems in rooting hormone powder and insert into the holes. Firm in gently. Mist the cuttings with water. The cuttings will need warmth to generate so put the pots in a propagator or heated greenhouse. Alternatively, they can be placed on a bright windowsill as long as they are out of direct sunlight. Keep an eye on the cuttings and do not let them dry out. Remove any dead or dying matter regularly. Once they have rooted you can pot each plant into a 9 cm pot. Pinching out the growing tips at this stage will encourage bushier growth. Keep them in a sheltered, frost-free spot, greenhouse or cold frame. They can be hardened off in a sheltered spot for a couple of weeks before planting out in May. Osteospermum are usually pest and disease free. Occasionally the leaves and flower buds may be attacked by aphids, and older plants are more susceptible to powdery mildew. Aphids, such as blackfly and greenfly, can be a problem for osteospermum. These insects can cause the leaves to become yellow and curled. Left untreated, the infested stems may begin to die off. They also seem to like the growing tips and buds of Cape daisy. Aphids can often be removed by spraying with a strong jet of water. Alternatively, spray with a soap solution. Encouraging beneficial insects such as ladybirds and lacewings can also help keep aphids under control. A severe infestation can be treated with an insecticide. Powdery mildew is occasionally a problem for osteospermum. You will see white powdery patches on the leaves if your plant is affected. Eventually, the leaves may go brown and drop off. This is rarely fatal to your plant; however, it makes it harder for the plant to photosynthesize and so can weaken the plant over time. Powdery mildew usually occurs in hot weather. Ensuring adequate air circulation around your plant can help. In particular, make sure there are no weeds encroaching on your plant’s space. Watering at the base of the plant, rather than the leaves can help discourage the growth of fungal diseases, too. Avoid overwatering if your plant if it is affected but do not let it become too dry either. You could also try a homemade mixture to treat the mildew. A mixture of 1 tablespoon of bicarbonate of soda and ½ teaspoon of liquid soap in a gallon of water can be sprayed onto the plants. Failing this, there are fungal sprays you can use if the problem is severe. Q My osteospermum has stopped flowering even though it is only mid-July and the weather is hot and sunny. What could be wrong? Osteospermum sometimes stops blooming during very hot dry weather. Don’t worry, once the heatwave is over they will start to bloom again. In the meantime, ensure that you water them regularly. If the plants dry out they can sometimes drop buds. Container grown plants may need watering daily in very hot weather. Once every few days may be required in plants in the ground while the dry spell lasts. Q My African daisies were blooming beautifully but they suddenly started wilting. The flower heads are now all pointing downwards. How can I perk these beauties up? It’s difficult to be sure what the problem is without knowing the variety, but here are a few possibilities. Firstly, make sure they are in a warm sunny position as they do not usually like cold weather. Secondly, water them as they begin to dry out, but not too often, as sitting in wet soil can cause the roots to rot. You should also feed them every two to three weeks in the growing season. It may just be that the weather has been a little too hot for them and they will perk up of their own accord when it cools down. Q Will my osteospermum survive winter or should I dig it up and put it in the greenhouse? This rather depends on the variety of osteospermum you have. Many varieties will survive over winter, but some tender varieties that are sold as bedding or houseplants, will not. If yours is a hardier variety, you should be okay if it is in a reasonably sheltered spot. I would recommend taking some cuttings in late summer or early autumn just in case it doesn’t make it through. If you are concerned though, you can dig it up and put it in a pot in the house or greenhouse over winter.